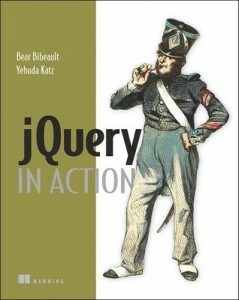 I just recently finished reading jQuery in Action by Bear Bibeaut and Yehuda Katz. I had used very little jQuery before reading it, and even less AJAX. I can’t recommend this book highly enough. Five Stars. To be fair, I may be biased largely because jQuery is so awesome, anything about jQuery will inherit it’s awesomeness. But either way, if you want to get into jQuery, this is a good place to start. I’ve heard it pointed out that all of the information in this book is already online, on the jQuery website. But that’s missing the point. The book presents the information at a well-thought out pace and order, minimizing confusion. For example, early on it spends a good amount of time introducing and explaining the various CSS3 selectors and getting your “Wrapped Set” of elements before it jumps into how to manipulate those elements. The book process to move through all of the awesomeness that jQuery offers with DOM & Content manipulation, Event Handling, Animations, Plugins, and Finally AJAX. My First attempt trying to implement AJAX was without a framework, using the WROX “Beginning AJAX” book. I’ve decided that book isn’t worth it’s weight in lead, and that it should be pulled from the shelves. jQuery makes it ridiculously easy to make POST and GET requests to the server, and handle the results. I was using AJAX in production code within a week of reading this. I don’t know what else to say. The level of Awesome that jQuery exudes is matched only by other epic wins such as Dropbox and Vim. If you haven’t tried jQuery, you need to. Now.